For the last week, NJ Governor Chris Christie has been running scared. 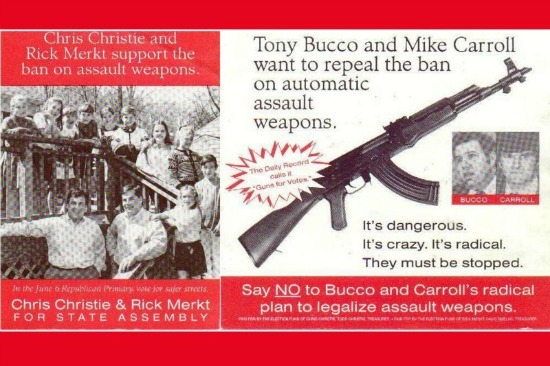 Christie, easily the most radically anti-gun candidate seeking the GOP nomination in the 2016 presidential cycle, is trying his best to hide, downplay, or flat out lie about his war on the Second Amendment. And he’s counting on gun owners in Iowa to accept his deceit – and give him the boost he needs to move onto the next state with a ‘respectable’ showing in Iowa. In the event that a gun owner calls him out for his anti-gun actions, Gov. Christie resorts to name calling and shouting to try to talk over his opponent. But all the bluster in the world couldn’t help Gov. Christie last week in Ankeny, IA, when an informed gun rights activist confronted the governor over his terrible record. Now, in what has become a national news story, the truth about Christie is getting out! Requiring gun dealers to make their records “open to inspection” for any reason to the state police – already notorious for their harassment of gun owners. But of course this only covers the last few years of Christie’s decades-long attack on the 2nd Amendment. That’s because when he first ran for office, clear back in 1993, it was to primary a pro-gun legislator who was trying to repeal the ban on modern rifles. That’s right. The main issue that Christie wanted to advance when running for his first state legislative office was gun control. More than that, Christie has done nothing to lift the permanent ban on gun shows in NJ, the ban on modern firearms, the one-gun-per-month law that draconically limits how many guns you may purchase, or the aggressive posturing of the State Police and the NJ Attorney General’s office that puts out-of-state gun owners through misery as we documented here. Armed with this information, a gun rights activist questioned Governor Christie on these facts at a recent campaign stop in Ankeny. When the activist persisted and asked why Christie wants to set up a firearms registry, via a government issued ID card for every purchase, Christie tried to shout again saying he stopped that bill. Of course you have Governor, of course you have – now that you want gun owners to help you. You see, this is classic Chris Christie. Side step, mock, then try to shout down any opposition. He called for a ban on .50 rifles, to please the gun-grabbers that elected him – and then vetoes the bill later on when muscled by gun owners in NJ as he tries to get votes from both sides. When he called for a government ID card to catalogue every firearms transaction in his state, clearly designed to establish a gun registry, he backed off once confronted by activists – again trying to get the support of both sides. But through it all, Christie’s never changed. He’s ALWAYS testing the wire looking for the right time to ram gun control through the legislature. He’s consistent, patient, and dedicated – to further eroding the 2nd Amendment in NJ. And now he’s trying to bamboozle gun owners in Iowa into supporting his bid for the White House. But Governor Christie has a problem now. Despite his childish tirades, the gun rights activist who was confronting him never backed down and calmly rattled off much of the record that the Governor is trying to bury. This story is now a national news story and Christie is desperately trying to explain away both his record and the irrational way he interacted with gun owners in Iowa. Just the other night he took to FOX News trying to downplay what happened here – hoping against hope that this will blow over. Don’t let it – please take a moment today to contact the Christie campaign! Tell him that you’re an Iowan, you will be voting in the caucuses, and that all of his spin, lies, and shouting won’t hide the fact that he’s spent his entire political career attacking the 2nd Amendment and the gun owners in NJ who support it. Inform him that calling for gun control one day, then stopping it the next, is not only anti-gun but makes him a political opportunist of the highest order and speaks volumes to you about whether or not he’d defend your gun rights if elected President. You can leave him that message on his Facebook page. You can call his campaign headquarters at 973-936-9318. And you can contact Christie’s Iowa director, Phil Valenziano, by calling 732-881-6185. I hope you’ll take a moment to do all of the above. Make sure Chris Christie knows that his loud-mouthed “deny, lie, and distort the facts” campaign will simply not work in Iowa. Tell him to come clean on his record. Tell him to apologize! When you’re through, be sure you send this to all of your pro-gun friends in Iowa as well. And, if you can, please consider a contribution to help Iowa Gun Owners in the fight as we expose anti-gun candidates all across the state. P.S. Chris Christie’s 20-yr radical war on the 2nd Amendment is coming to home to roost as his confrontation with a gun rights activist at a town hall meeting last weekend in Ankeny has erupted all over national news. When confronted with the very facts he’s trying to keep buried, Christie had what the media called an “epic meltdown” and began screaming and shouting at this gun owner. Christie is desperately trying to keep this and his long history of attacks on your gun rights secret – hoping to get gun owners to back his bid for the GOP nomination. Contact Christie’s campaign today and tell him that you’re an Iowan, you will be voting in the caucuses, and that all his spin, lies, and shouting won’t hide the fact that he’s spent his entire political career attacking the 2nd Amendment and the gun owners in NJ who support it.